While I do not yet live a zero waste lifestyle I am trying to make changes both in my everyday life and while I travel to use less plastic and become a more sustainable traveler. One of the things I am doing to travel more green is to start replacing my travel gear with more eco-friendly travel products, accessories and toiletries to minimize my use of single use plastic and create less waste. 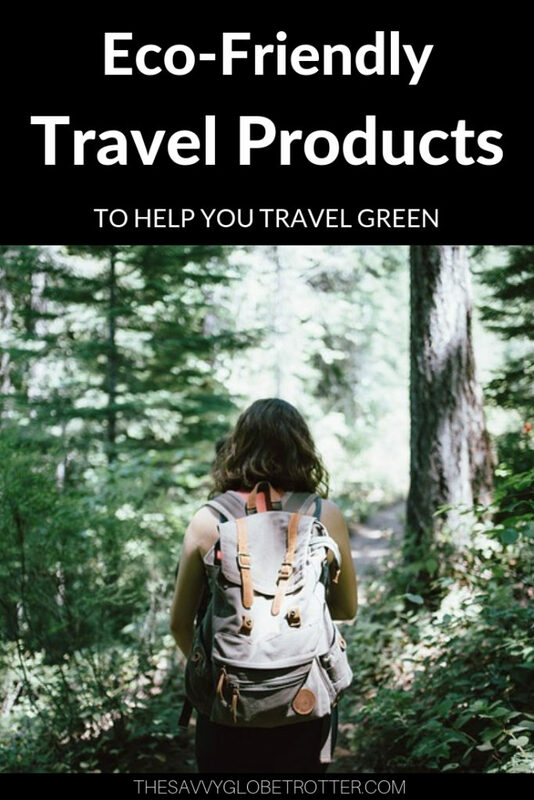 Here are my picks of the best eco-friendly travel products and accessories for those of you that want to be a more sustainable traveler. Using a reusable water bottle is one of the easiest way to be a more sustainable traveler. Instead of buying bottled water every time I want water and ending up throwing out tons of plastic bottles, I can fill my reusable water bottle. I drink a lot of water so not only is this environmentally friendly but it is a saves me money by not having to buy bottled water. I have been using a Klean Kanteen reusable water bottle for years and I love it because it is insulated and keeps my drinks hot or cold. For those traveling to countries where the water is not safe for drinking you can save money and the environment by using this personal water filter which transforms contaminated water into clean and safe drinking water. Using a reusable shopping bag is another easy way to be more environmentally friendly when you travel. Instead of getting a bunch of plastic bags when you go shopping, you can use your reusable shopping bag to carry back your purchases. This reusable shopping bag are not only cute but they are foldable so you can toss one or two in your day bag and pull it out when you buy something. I always travel with one of more external batteries to recharge my phone and other electronics when I am not close to a power outlet. If you spend a lot of time outdoors a solar portable charger is a great environmentally friendly alternative. Instead of constantly buying liquid shampoo in throw-away plastic bottles, shampoo bars are a great alternative because you can carry them in a box or tin can that you can reuse. This all in one eco friendly shampoo for men and women can be used as a shampoo, body soap, face soap, or shave soap. It comes with a recyclable box for storage and is also cruelty-free and vegan. Plastic straws are one of the most harmful single-use plastic products. It is estimated that 500 million straws are used and thrown away every day in the USA (source). If you order a lot of drinks that you drink with a straw instead of using plastic straws, you can use a metal or bamboo straw. This set of 4 metal straws comes with a free cleaning brush. If you find yourself using a lot plastic silverware consider purchasing a bamboo set of utensils. Toothbrushes are not biodegradable. A switch to a bamboo toothbrush is easy, affordable and the best option for the planet. While initially more expensive, switching to a safety razor instead of a disposable plastic razors is a good investment. Tampons and pads are a huge contributor to landfill waste. Using a menstrual cup is a great alternative -not only is it more environmentally friendly, you don’t have to change it as often, and don’t need to find somewhere to throw it away. This DivaCup gets great reviews on Amazon. Did you know that most chemical sunscreens are dangerous for reefs? Hawaii has even banned sunscreen that has ingredients that harm coral reefs. This reef safe sunscreen is not only eco-friendly it is also hypoallergenic and biodegradable. I think even small changes make a difference and even if you can’t commit to a plastic free lifestyle or don’t want to replace all your travel products, you can maybe make a couple of changes. Starting with using a reusable water bottle and a reusable shopping bag as these are super easy changes to make. 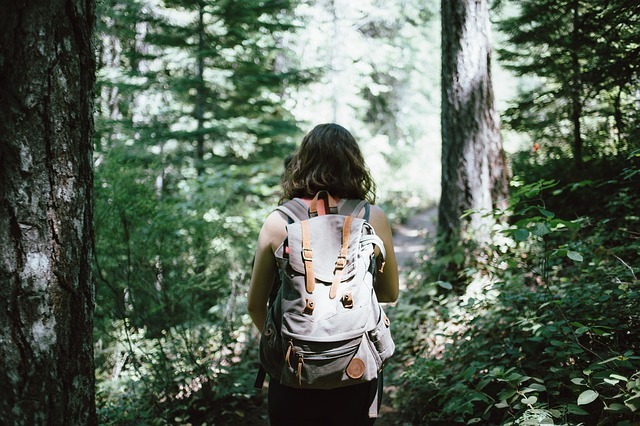 What are your favorite eco-friendly travel products and accessories? I love my Klean Kanteen water bottle but I have heard great things about Swell. These are excellent suggestions. It is amazing when someone lists all the great suggestions and you really look at them, how easy it would be to reduce our footprint for negligible amount of time and effort. 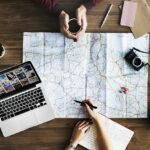 An excellent list of items for those looking to become eco-friendly and responsible travellers! 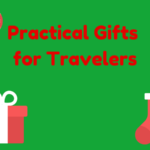 I already have some of these items as essentials on my packing list and am hoping to make other changes to eliminate usage of plastic and use other eco-friendly alternatives. Very nice! The solar charger would be the greatest use for us, considering we are mountaineers, and we are usually out there in the wilderness. Having a ready power source will surely help. I like the idea of solar power charger. Reading this has made me really think about the way I travel and what I use. I’ll also be getting a resuable bag and bottle for sure. Great ideas! I have a solar charger for my phone and it comes in really handy, especially since I live in Florida. I’ve always wanted to try the personal water filter and travel with it.